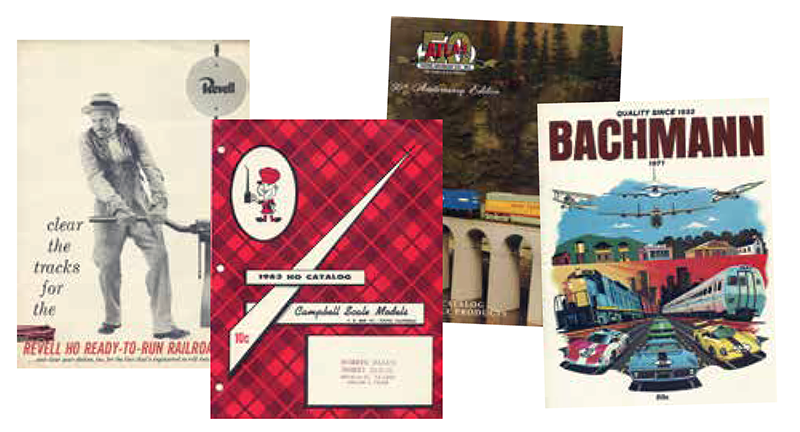 Along with examples of model trains, do you also search for and collect examples of catalogs and other various promotional literature produced by hobby manufacturers? For me, this segment of model train collecting is every bit as important and exciting as the actual produced products themselves. What makes vintage HO literature challenging is not the lack of publications and related materials produced over the years, but the lack of retention of those now-precious items. Thanks to its market share and the many companies participating in HO scale, the amount of promotional materials produced is large. However, take a look around at the next swap meet you attend or go on eBay and search for old HO product catalogs, and you’re likely to be disappointed. My experience in the 25 years that I’ve been seriously pursuing vintage HO scale has shown me that hobbyists kept literature from larger scale (American Flyer, Marx, and Lionel) and European manufacturers (Fleischmann, Kibri, and Märklin). You’ll find decent availability on older Walthers annual HO catalogs but try quickly assembling a complete set of, say, Bachmann publications from 1970 to the present. I spent many years looking for the last couple years needed to build a full run of Bachmann from the late 1960s to the present. Surprisingly, it was years in the late 1980s and early 1990s that showed up last for my collection of those catalogs. This is an overlooked part of the enjoyment of collecting vintage model trains. My recommendation to anyone seriously into collecting is to acquire back issue runs of Model Railroader, Railroad Model Craftsman, and don’t forget other important magazines now gone from the scene: Railroad Modeler, Prototype Modeler, Mainline Modeler, Rail Model Journal, and others. These are all beneficial in your knowledge of what products were available when, and the reviews and uses of those items is very entertaining reading. The manufacturer ads included in those back issues provide excellent information, and sometimes offer the only source from the company for what it was producing. Regarding documenting the past products via ads in hobby magazines, Athearn is a great example. The company produced several great catalogs during the second half of the 1950s and just into the 1960s… Then nothing until the 1990s. If you want to have a printed record on Athearn production from the mid-1960s to near contemporary years, you’ll need all those full-page ads that ran in magazines. Beyond a document of what a company listed for its line at various times, the other aspect of owning catalogs is finding things that never saw production, or when a model did arrive, it oftentimes looked much different from the mock-up or pre-production effort displayed in a catalog. There are countless examples of those, “Oh wow, look at that!” type of models that make appearances in catalogs only. I’ve shared a few of my favorites for you here, but I’m sure readers have others I’ve overlooked or didn’t have space to share. Let me know what you’ve found fascinating that was exclusive to hobby manufacturer literature and never touched a modeler’s pike or resided on a collector’s shelf.